Before spending a month traveling around the Western United States, my experience with hot springs was limited to a free outdoor stream I managed to find in Costa Rica. However, after dipping into near-boiling waters across Wyoming and Montana, I’ve been a bit more of a hot springs expert. The National Park Service doesn’t exactly advertise The Boiling River as a public bathing area, so you won’t see any signs with arrows pointing you to it. Park your car on the east side of the road near the “45th Parallel of Latitude – Halfway Between Equator and North Pole” sign at the Montana/Wyoming state line in the park. As you walk about a half mile upstream from the parking area, you’l start wondering if this hot springs really does exist. Keep walking…you’ll be seeing clouds of stream soon enough. Cold water from the Gardiner River and hot water from the Boiling River meet at this point and swirl around to create a pleasant temperature. Although the National Park Service website claims the area is closed in springtime due to high water levels, we and other bathers were splashing around on April 11th when it was barely above freezing. There’s no rangers around and the water is miserably scalding in certain parts, but it is free to get in (after you’ve paid your national park fee at the entrance, of course). I only lasted a couple minutes in my bathing suit, but my boyfriend got a full blown shower out of it. 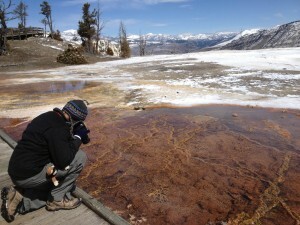 If you’ve been camping in a 20-degree blizzard in Yellowstone National Park for awhile, these hot springs feel amazing. If you’re looking to relax your mind and soothe your soul, you’re better off hitting the hot tub at the Holiday Inn. These hot springs look exactly like a public pool, and they’re just as crowded as one too. 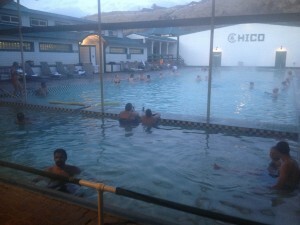 The pools are located on the outskirts of Bozeman, near Four Corners, and it costs $8.50 per adult to get in the door. You can dip into six different pools after you toss your clothes in a locker, and one of them is even outside. The inside pools are split into two sections and have different temperatures to test out. These hot springs have pretty limited hours, so families with dozens of obnoxious children cram into steamy pools with fun noodles and inflatable arm bands. If you can squeeze into the outdoor pool after the sun goes down, you can look up at the stars and experience the extremes of hot and cold at the same time. Drive half an hour north of Yellowstone to Pray, Montana to experience the best hot springs in a reasonable driving distance. I was initially intimidated by Chico because it’s a day spa resort and I saw dollar signs flashing before my eyes. 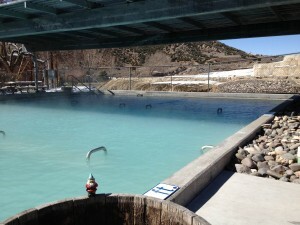 Believe it or not, a day pass is only $7.50 to use these hot springs. Chico has two large pools, one set at 96-degrees and the other at 103-degrees. We liked this place so much that we splurged for a one-night stay and soaked in the hot springs for a second day. Unlike the first two springs I mentioned, these are pools that you can bring booze into….which is a huge bonus. Visit the pool-side bar for local beers and mixed drinks that you can take with you in plastic cups into the pool. These hot springs were mostly filled with adult couples and retirees, so the atmosphere was quiet, peaceful, and relaxing. You don’t have to fight for a corner to sit in at Chico, and you can hang out at their bar and use their free Wi Fi while you’re there as well. After visiting a few hot springs in the cold weather, you’ll likely develop an addiction for all things producing steam. We traveled to Thermopolis, Wyoming simply because the name sounded warm. Thermopolis has a free public bathhouse that is run by the state, and it feels like it. There’s a 20-minute soaking limit in these springs, which are located right in the middle of Hot Springs State Park, which is right in the middle of the town. You’re required to sign in at the front desk and stick to a brief dip to avoid reprimand. Bypass the indoor pool and hurry over to the outdoor pool, which has an awing overhead to shield you from sun and snow. Aside from some easy hiking trails with informational plaques about the history of hot springs in the West, there isn’t a whole lot to do in this small town. So while these hot springs feel rushed, the water temperature is great and you can’t beat free entertainment. Unfortunately, our hot springs tour ended on a sour note. On the drive back to Chicago, we made a point to stop on the last hot springs to be found: Evan’s Plunge. I found it surprising that a town called “Hot Springs” only had one hot springs facility, even if it was in South Dakota. We arrived at Evan’s Plunge shortly before closing time, hoping to catch a dip before they closed their doors. We were absolutely the only people in the pool, which had a freezing temperature and a depressing 1970s theme park vibe. They claim the water is 87-degrees, but it was downright frigid compared to the other hot springs we’d recently been to. Not only was the water cold, but it cost a whopping $12.50 per person to get it. A few teenagers showed up after we went down the slides a couple times for the hell of it. After the water temperature became unbearable, we relocated to the hot tubs, which contained no natural mineral water at all and were too hot to bear for more than a couple minutes at a time. 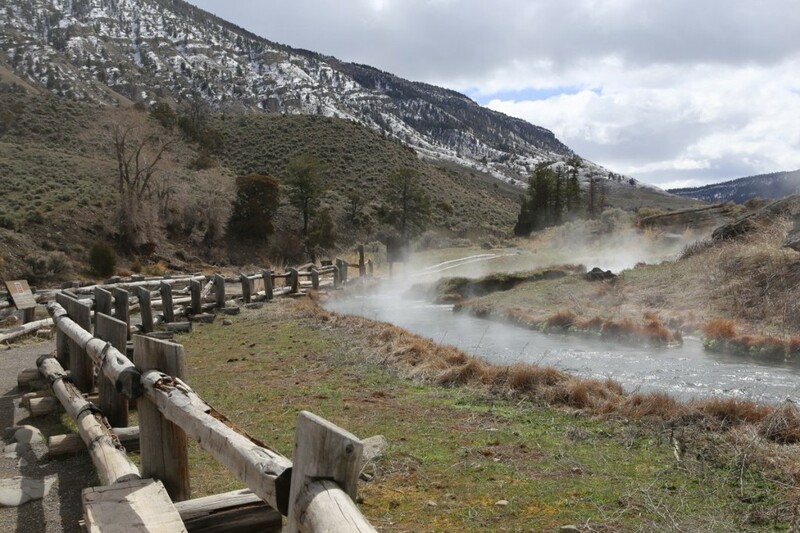 So if you’re planning on heading out west anytime soon, you should definitely check out some hot springs if the temperature dip a little low. My advise? Check out Yellowstone’s Boiling River for an amazing view and unique experience, and check out Chico Hot Springs to experience affordable relaxation the way nature intended. This entry was posted in Water and tagged hot springs, montana, south dakota, Wyoming by alyssa. Bookmark the permalink.